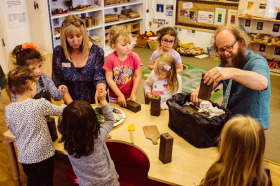 Wienerberger, the UK’s leading provider of building material solutions, has donated 16,000 clay bricks to Hull’s 151 nursery schools as part of a project to get children involved in Hull UK City of Culture 2017. The children have sculpted a Wienerberger brick as part of the project which will then be dried and fired to create an art installation for the city centre later this year. Children across Hull aged 0 – 5 have sculpted their clay bricks as part of an Early Years project for the City of Culture 2017 called ‘The Sixteen Thousand’, with this representing the 16,000 0-5 year olds in the city. Now sculpted, the bricks will be dried and fired at Wienerberger’s roof tile factory in Broomfleet and will be used for a final installation which will be situated in Hull city centre and displayed between Monday 2nd October – Sunday 5th November. Weinerberger's master clay carver Ian Martinson said: “Clay is the oldest artistic material and has been used for centuries to create both practical and aesthetic pieces. It has been a pleasure encouraging the children to work with these materials in this way from such an early age, allowing them to express themselves to celebrate the City of Culture in Hull."